Self-adhesive acid-free black mounting corners 1/2". Easily mounts photos and memorabilia to scrapbook pages or other paper surfaces. Box of 250 corners. 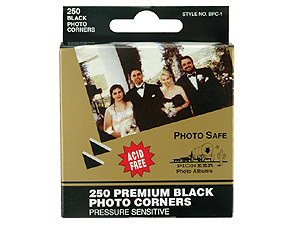 Self-adhesive acid-free black mounting corners 1/2". Easily mounts photos and memorabilia to scrapbook pages or other paper surfaces.